Our otters Ollie and Lucy, love the summer holidays and meeting all the new visitors. They especially like their feed time which takes place daily at 10.30am and 3pm. This is when their keepers get to tell you all about what they have got up to that day and also how their species can survive in the wild. 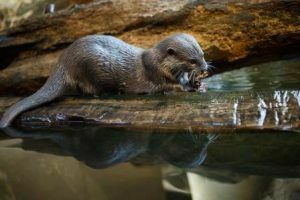 Enrichment is a big part of the otters day and keepers make sure that daily enrichment activities happen for the otters, ensuring that Ollie and Lucy experience things similar to they would in the wild whilst also keep their brains active.